Had some time to play with this beautiful floral set. 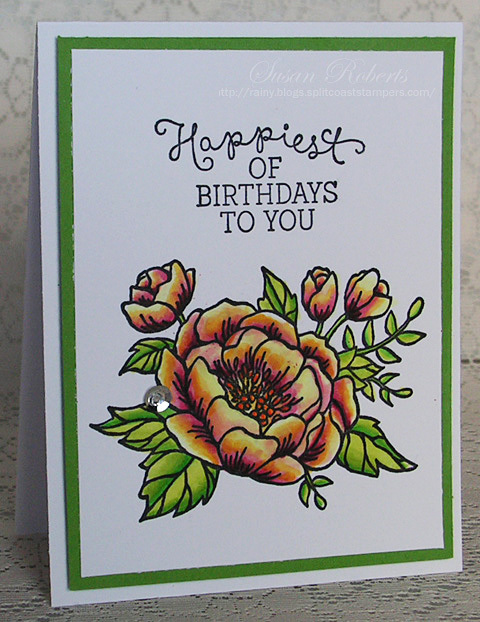 On this first card the image was stamped with a light pink ink. As the blooms were colored, the lines blended away. Love this watercolored look! However, next time I’ll have to remember to stamp the leaves using green ink! This is another floral image from the set. After coloring, the image was fussy cut. 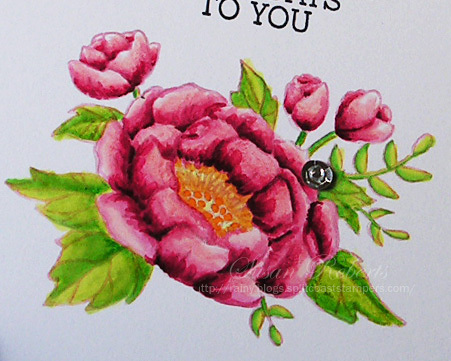 A black marker was used to color around the flower to eliminate the white edge. The flower was then adhered to a dry embossed piece of designer paper. 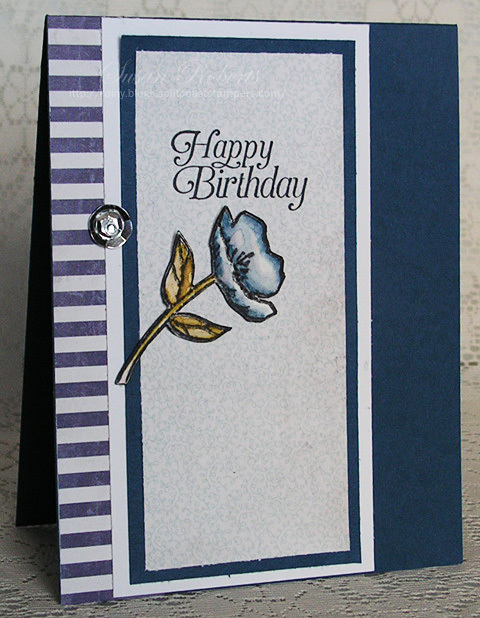 This last card uses the same image as the first, but this time it is stamped using black ink. The lines are meant to be seen for a much bolder look. These are so beautiful! 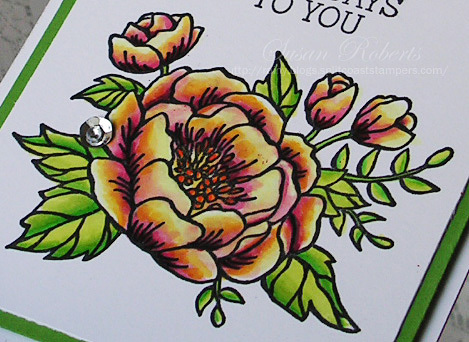 I love how you blend the colors to make the flowers look so beautiful & natural! Love the first card, the red looks just wonderful! I love how the lines blend. Also the other cards are stunning, well done! 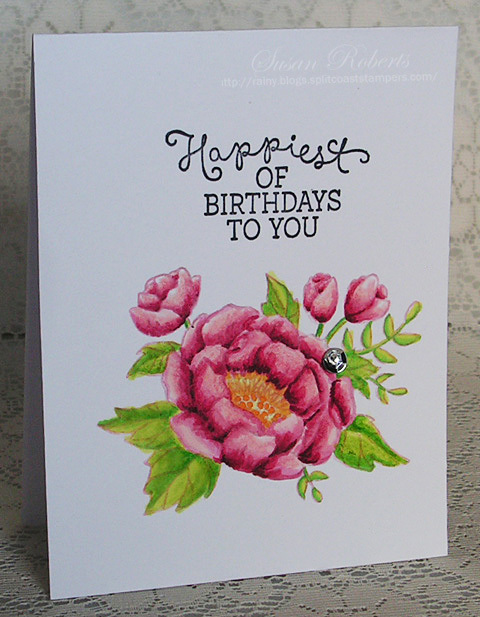 Your pink peony just pops so beautifully against the white! Love it! Thanks so much for joining us at Color Throwdown! Three very different cards with a beautiful stamp set! Love the no-line look of the first, and the last looks almost like stained glass. Fabulous, Susan! These are gorgeous! Makes me want to get this stamp out and ink it up! These are all just beautiful, you did an amazing job with the no line coloring, I have seen red in the veins of leaves so that looks fine. I love how you get a whole different look by just the way you colored these!! Oh, Susan, these are gorgeous! I love your no-line coloring on the first card. And don’t worry about the outline on the leafs. It’s perfect. 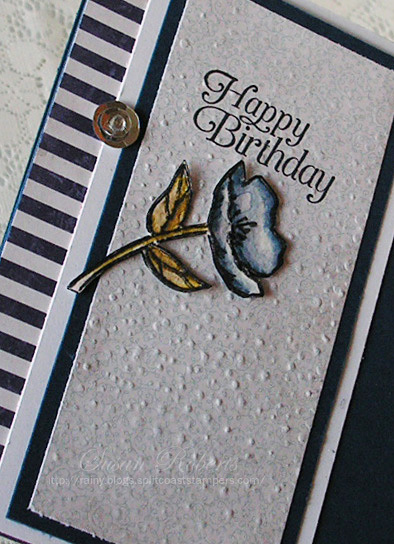 And the second is beautiful with the single blossom against the Falling Softly embossing folder (that’s on my wish list). And finally, the last one is beautiful as well and perfectly colored. And I love the simple matting. Three gorgeous cards, sweet friend, and I just love this set! Warm hugs! Absolutely gorgeous cards. Have a wonderful weekend! Beautiful cards! Thanks for joining us at Cards In Envy! Beautiful Cards! Love the pink roses for the one for our challenge! Thanks for sharing with us at Cards in Envy!